In 2000, three TCU grads started their own theater company, hoping to expand the range of performing arts in Fort Worth. 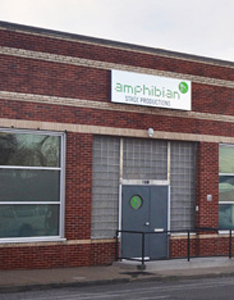 Amphibian Stage Productions started small, with a version of Lanford Wilson’s Burn This as the only output of its inaugural season. But ASP’s influence slowly grew over the next few years, and the company added to its season, developed community outreach programs, and produced plays in both Fort Worth and New York City annually. For more than ten years, the company put on two or three main stage plays a season in the Fort Worth Community Arts Center on Gendy Street. In May of 2012, the theater company embarked on a capital campaign (spearheaded by Kevin Kline, no less) that led them to their new home in the up-and-coming South Main corridor. It was purchased and renovated with the help of architect and ASP board chair Gregory Ibanez by October. This new building houses the theater’s administrative offices, a larger performance space named the Berlene T. and Jarrell R. Milburn Theatre, and a convertible black box.